Hi Everyone! Hope you are enjoying your summer holidays, wherever you are in our beautiful world! Here's what I want you to think about today: Reduction of sugar=reduction of fat! Dress plain Greek yogurt with cinnamon. Make a natural fruit juice with real fruit and a blender instead of drinking juice from a can, bottle or jar. (It's easier than you think it is! Follow my tutorial here). Drink green tea instead of coffee to reduce sugar intake! Serve your food really hot to slow your pace of eating. Drink carbonated water before eating. BREAKFAST: 1 boiled egg, 1 slice of toasted bread, 1 yogurt and 1 piece of fruit with green tea. PM SNACK: 10 almonds without salt and with craisins. DINNER: Greek salad with white cheese, dressed with lemon and a bit of salt. Melon for dessert. 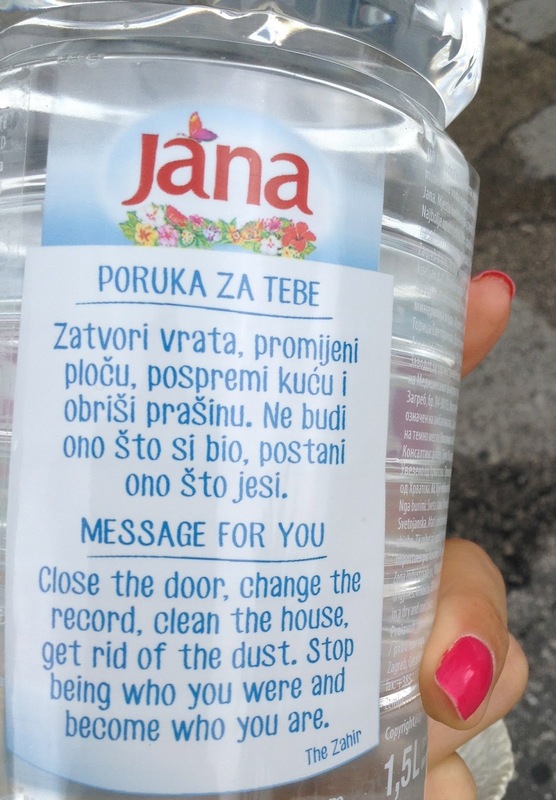 One final thought, brought to you by my water bottle in Croatia..
Stop being who you were and become who you are!